We are please to inform you that after a long and fruitful journey, Karachi has been declared a Compassionate City. We embarked on this quest last year in August when we introduced the concept of a compassionate city to over 3500 children with the help of a play that ran for 5 days. After the play we launched our Five Visions Campaign which allowed us to seek visions of a compassionate Karachi from citizens in 400 schools, 28 Universities, 100 organizations, Several associations, and the prisons from Karachi central jail as well. This campaign helped us collect over 400,000 visions from all across the city. The Five Visions Campaign allowed us to select the 5 most commonly shared visions and then draft a charter for Compassionate Karachi based on those visions. This Charter was then revealed to the general public at the Mazar-e-Quaid (Nation's founding Father's mausoleum) with the Commissioner of Karachi. The revealing of the cCharter launched a One Million signature campaign where we once again went to 400 schools, 28 Universities 100 organizations and associations to petition the Charter. On 22nd May 2015, Karachi was declared as a Compassionate city. The subtropical seaport of Karachi is an exploding population bomb, the world’s fastest-growing mega-city. More than 1,000 migrants pile out of buses and trains each day, ratcheting up the population of 22 million. “They leave bombed-out villages in the tribal north or parched hamlets in South Punjab to come settle at the edge of sewers in unplanned slums,” seeking survival as laborers, Karachi novelist Muhammad Hanif wrote this summer. The migrants keep coming even though “Karachi is known for killing its residents,” Hanif wrote. Crime and battles among the city’s criminal gangs, rival ethnic militias and Pakistani Taliban pushed violent deaths to about 3,000 in each of the past three years. But Karachi also is a hub of Pakistani culture and civil society, including a chapter of Charter for Compassion, the global movement co-led by South African Archbishop Desmond Tutu. The local group is campaigning through Karachi’s schools to build a tolerant, compassionate city. It’s a project supported by the U.S. Institute of Peace. For both education and social peace, Pakistan’s crisis-stricken government schools may these days be as much a problem as a solution. Fully a third of Pakistani families opt to send their children to the country’s thousands of private schools. Public school curricula, still echoing the “Islamization” policies of a 1980s military regime, help create the culture that has fed extremism and terrorism over four decades, scholars say. Government textbooks teach narrow attitudes, notably toward religious minorities, India and the United States, said a 2015 USIP report by Pakistani economist Madiha Afzal. “I’ll be blunt; the Pakistani [state] system has become more intolerant toward other religions over the years,” said Kermin Parakh, a member of the minority Parsi community and principal of one of Karachi’s most prominent private schools. “Yet a big part of the society still thinks in a broad-minded way, and we must build upon that,” said Parakh, whose BVS Parsi High School is part of the Karachi peace campaign. In Karachi, many government schools are dilapidated and lack computers or books. Most offer little more than rote memorization of texts that, even after a 2006 reform, include “distortion of history, creation of irrational hate and blinding prejudice against non-Muslim groups,” wrote A.H. Nayyar, a prominent university professor and analyst of Pakistan’s educational system. 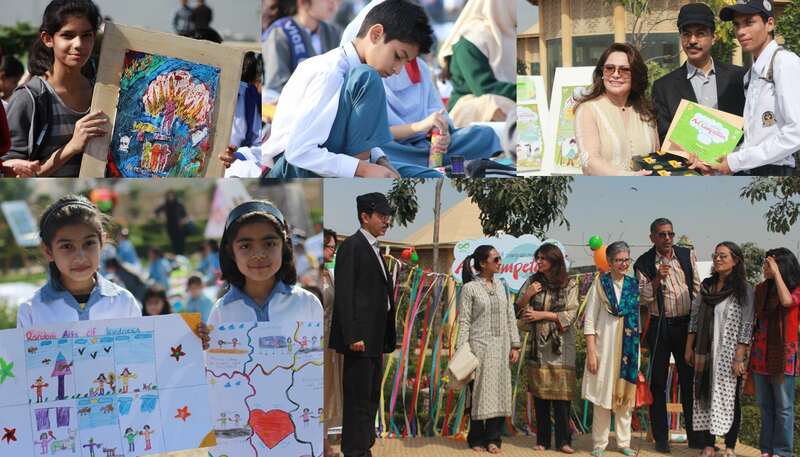 Charter for Compassion Pakistan (CfC) gathered 76 Karachi schools to build a supplementary curriculum to teach empathy, courage, gratitude and other elements of a more tolerant culture, said the program’s manager, Zareen Qureshi. It reaches children through classroom lessons, art, sports—and an annual contest to design community service projects for the Islamic holy month of Ramadan. A ninth-grade Ramadan contestant organized schools in wealthier neighborhoods to build libraries at some of the many Karachi schools whose children have no access to books. At each school, CfC begins with months of intensive training for teachers, including help to write new lesson plans. “The first need is for the teachers to broaden their own minds,” said Parakh, the school principal. Afterward, CfC staff members return every month or two for workshops, classes and events to expand the new lessons and engage students, Qureshi said in a telephone interview. CfC’s campaign, called the Compassionate School Network, says it reached 32,000 students in its first two years. “Our aim is to grow the network to 5,000 schools by the year 2018, educating approximately 2 million children of Pakistan to become compassionate leaders in the coming decades,” says the campaign’s website. Karachi’s newspaper, Dawn, has called Lyari “Gangland.” It “resembles a war zone,” the weekly Friday Times wrote last year. “Children in Lyari are quite isolated, and may not have any experience” even of the wider city of which they are a part, Qureshi said. “We felt that we had to go there” with the compassionate school campaign, she said. Lyari is one of many neighborhoods where the schools campaign uses public art by children to counter the esthetic and oppose the violence of Karachi’s slums. CfC gathered students to design and paint bright murals on the high, brick walls around their schools that proclaim the attributes of a compassionate society. And CfC uses Pakistan’s national sports obsession, cricket, as the draw for thousands of schoolboys. Coaches teach compassion and tolerance along with the batting and fielding instruction. When the cricket program held a tournament last year, it paid extra fees to have a bus company drop each young player from Lyari directly at his home after the matches because a wave of killings had made the streets unsafe. One night, CfC employees arrived at their rented field to find that members of a local political party had occupied it for their own cricket match. Forced out by armed guards accompanying the political workers, CfC had to re-schedule the tournament, paying extra costs. USIP has funded other work with Pakistanis to build a more peaceful, tolerant society, notably through their schools. The Institute supported a Canadian organization, Peaceful Schools International, in producing a guidebook to help schools in Pakistan or other developing countries create their own peace curricula. USIP also has trained a network of Pakistani mediators who work professionally to help resolve community level conflicts, such as fights over land. James Rupert is a senior writer and editor at the U.S. Institute of Peace. As a foreign affairs correspondent Rupert has reported from more than 70 countries for the Washington Post, Newsday and Bloomberg News, and served as a foreign affairs editor at the Post and Newsday. Over a 30-year journalism career, he has served as a resident correspondent in Morocco, Tunisia, France, India, Uzbekistan, Ukraine, Cote d’Ivoire and Pakistan. His coverage has focused heavily on South and Central Asia, the Arab and Islamic worlds, the former Soviet Union and Sub-Saharan Africa.Rupert is a former Alicia Patterson Fellow and Michigan Journalism (now Knight-Wallace) Fellow. Before joining USIP in 2015, he served as a writer at the Atlantic Council and editor of its UkraineAlert newsletter.Rupert graduated from Swarthmore College in 1979 and served as a Peace Corps volunteer, building and teaching in a vocational school in Morocco.